Some months ago I’ve created the Citrix PVS Health-Check Script which is a based on the idea and some parts of code from the Health-Check Script for XenApp 6.x of Jason Poyer (http://deptive.co.nz/) . Because now XenApp 7 with the Release 7.6 is finally in a state where considering an upgrade of the 6.x farms make sense, I belief that the demand for a XenApp 7.x Health Check Script grows. So I did it again and took the “HealthCheck framework” to build a new version which combines the Power of the Citrix PS-Snappins for XenDesktop/XenApp and the HTML-Output-Script of the existing HealthCheck Scripts. The result is a new HealthCheck Script which is usable for XenApp and XenDesktop 7.x and what makes me also happy, with only a few line of more code the Script is downwardly compatible for XenDesktop 5.6 environments. This is just the first version and I’m sure that more check’s need to be added. Feedback and “Feature requests” are welcome … And to be honest I have not yet a big environment to test my Script, so please be insightfully if you find some bugs and report them to me. In the first part of the Script you are able to configure some parameters. You can decide if you only want to see the “bad” Desktops on which something it’s going wrong or if you want see everything. In huge XenDesktop environments you want definitely only see the bad machines … ( $ShowOnlyErrorVDI = 1 ) Also you can decide if you want only report XenApp or only XenDesktop or both. The Desktops and XenApps are in two different Tables. It’s also possible to exclude Collections ($ExcludeCatalogs) from the Check, so virtual Desktops which are for testing purposes are not checked. If you have a feature request or a bug report please post it direct on GitHub. If you need a Health Check Script for XenApp Version which are older than XenApp 7.x see http://deptive.co.nz/xenapp-farm-health-check-v2 where it’s an excellent work and the inspiration for my HealthCheck-Scripts! For Bug Reports or feature Request please use GitHub, of course you can also contribute on this code! What’s your path were the Script is? It has maybe a blank inside? I am running into an issue running this on a XenApp 7.12 environment. It will not gather the XenApp Server information or add it into the report even though the flag in the config file is set to 1. The variable ‘$ShowXenAppTable’ cannot be retrieved because it has not been set. does the XML exists at the right place? Are variables filled in the XML? I was able to identify the source of the issue. I had an errant Unicode character in the xml file from when I was editing. Great – sorry that I wasn’t a help. But happy that it works now. 1 enhancement that would be highly beneficial would be a column for calculation of % of disk space free. Color coded with the parameters for Alert and Critical in the configuration file. I’ll put that in the feature request queue on GitHub. I have both environment with two different sites (XA7.12 & XD7.12). I have provided both delivery controllers XA&XD and also set the value 1 for XA and XD table , but it is giving the information for one site only either XA or XD. I am looking for single consolidated report as shown above, Can you please help me to fix this. Enclosing the parameters below which I have provided in xml file. Thanks a lot. Some of the VDA vdisk is on E: and some on F:, how do I make the script to capture vDisk info other than D: drive? that’s currently not possible with the Script, you can change it to E or F. But the script currenktly is intended to have only one unique letter for the write cache. Awesome Sebastiaan, Thank’s – I’ve just uploaded your improved version! I do have one pretty important addition to the Health Check script! You should add one more column to the VDA list (and to the Assignment table) that shows Maintenance Mode Enabled!! Nice to read a comment from you in my Blog. I have already the column in the XenApp part added by Sebastiaan Brozius. Thanks for the hint, I will also add a column in the VDA section and the Assignment table. I’ll take it on my list for FeatureRequests and try to implement it in a future version. Hi Raj, I am Sacha 🙂 you don’t need an SDK, its just PowerShell. 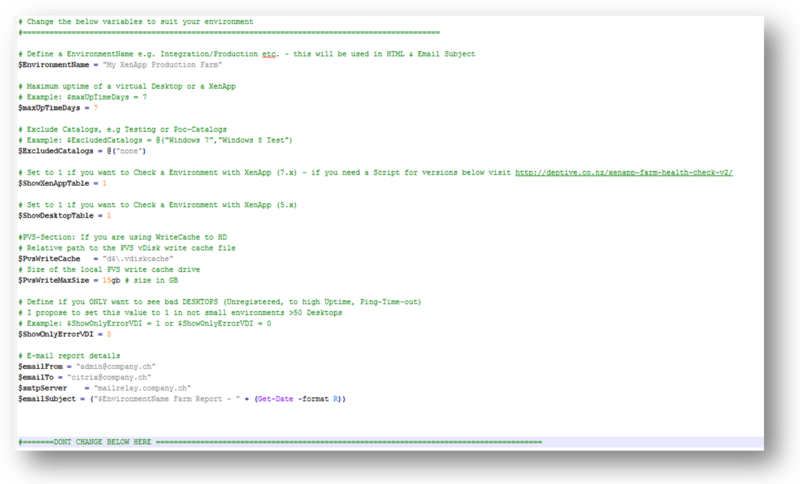 I work with notepad++ to developp my scripts. That’s possible. I will have a look on the next version of the Script. Thanks for your Input Luis! It should run on the DDC, no idea why you get this error. Do you run it as admin? Has the user who run the script write access in this folder? Btw: Check also my PVS HealthCheck Script. I am running it on a DDC- I am running PS as admin and my creds are Domain Admin. I have local admin on all enterpris servers, as well. This is what I pasted into my file (less specifics). Does the formatting look alright to you? Thank you, Sacha! I’ll give that a shot and let you know- thanks a ton! What does Desktops Free give us? Check the Version 0.9 – I’ve made some corrections. Sacha, any reason for not seeing the Spooler and the CitrixPrint column? Hi Rajen, under XenApp both should be visible, under XenDesktop those columns doesent exist. 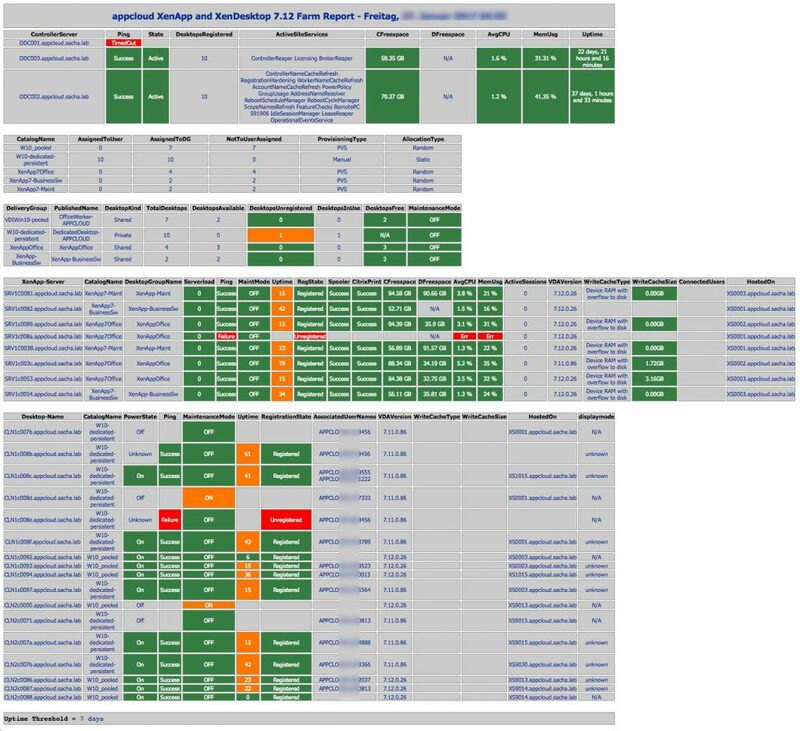 Realy awesome script and job, for our 15 customers “Farms” i integrated in scom with scheduled tasks. Just checked, for me in 7.6 it still works fine. Be carefull it’s in the current version only possible to exclude MaschineCatalogs, not DeliveryGroups! Could you explain “desktops free column”? The script is great but I do not understand the value of this field? If you have e.g. 50 pooled VDIs and there are 14 in use, you can see that you have 36 Free desktops. Guess this feature is only relevant for pooled desktops – maybe I need to filter out dedicated desktops in the next version. Yes, good point. My XD Sites (3 separate data centers) are using dedicated desktops. Our XD sites are mixing Pooled PVS and Dedicated. In the same delivery group?? XD Sites in 3 Data Centers with dedicated desktops in unique Catalogs and Delivery Groups. Thank you for this script Sacha, it’s really useful. In my environment the script seems to not detect the shared XenApp desktops correctly, so the ‘DesktopsFree’ column in DeliveryGroup check is showing a negative number instead of ‘N/A (XenApp)’ as shown in your example. Any ideas why this would happen? Appreciated the script it is awesome. Hi Majeed Attar, thank you for your comment. Where do you mean, guess in XenApp section. But I don’t have this Get-BrokerSession code. Ahhh – I will have a look in the next version of the Script. when can we expect the next version? I have no fixed releases, it depends always about the needs and my free time. Sorry. I just checked again your “FeatureRequest” but what acutal you want to get from Get-BrokerSession | Select-Object -Property UserName – you wish a list of all current connected users in XenApp and the one conencted user on XenDesktop? This is a very dynamic data and I’m not sure if I need to add this in a HealthCheck-Script because the logged-on user name is not impacting the health of a server. Or do I missunderstand your request? We use xenapp and has published Desktop as application..now if i run this command on Delivery controller it give me the output with user id and also shows if user has 2 session or not.. I will have a look what I can do. Majeed Attar I really want to help you and to fulfill your requirements, but currently it’s still a bit fuzzy what you need. Can you specify more exact your request. Do you wish to know the users of the single server or of the farm? What’s the intention for this information, do you want to know if you have an issue with session sharing? So I need only to output the dublicate sessions in a unique delivery group? Just to create a table with all logged on users will not be helpful in a health-check script. Consider that this script need to fulfill requirements of small and very large farms – so I need to have a usefull information at a glance even on a farm with 20’000 logged on users. Actually i need to get the current connected user of farm. so i can see how many of the user have duplicate session so it will easy for us to troubleshoot further as we are facing the issue that some random users are not able to connect on first attempt.. some time user has disconnected session and they try to connect but failed to do same.. I believe you should setup an OData API feed from Director. I don’t believe Sacha’s script is the place for this. So a new table with this single information will be enough for you? No relation to a Server or Desktop? Thanks for the updated version – this script is just awesome! Yes, definitely a typo. I’ll fix it in next version. if a WMI request will result in an answer. Good Input, something for my next version. Hi Sacha, your Script is great as I have used it. To get more details of Xendesktop infrastructure, did you update this script in latest version? If yes, may I have that script? Sorry no newer Version currently – I have always the newest version online. But no alway time to create new versions. Awesome script, really appreciate the work. I have one question about the “serverload” section, all the columns are showing up red no matter what value is in it, (0,40,80,160,200,240,280, etc.) any ideas? Some machines have only 1 user on it and still shows red. Possibly a bug in my script – I’ll check that. Thanks for that feedback. With version 0.93 of the script the email does not send when using more than one email address. It works fine with just one address, but if you add more addresses the mail never sends. This worked fine in version 0.92. In previous versions of the script each email address had to be in quotation marks (separated by a comma). I know – my fault that I’ve not adjusted that in the variable section. What are the chances you could add a variable to sends an email only if an error/warning is detected some where in the process? I did something like this on the older one because the people I worked with didn’t really care for the spam since our uptime was about 90%. Hi, this is something what it’s planed in a future release for both of my health check scripts (XA/XD and PVS), but need a bit time to implement and test. But it’s definitely on my todo list, but not with highest priority to be honest. Sacha, how can I get the total session count and have it displayed on top somewhere? Awesome. Thanks again for taking the time to write this script, sharing it and continuing to update it. Having an issue running this against a XA and XD environment. It runs successfully against either independently, but both are placed into $DeliveryControllers the test only completes for the first entry regardless of ordering. Is this by design? When I looked at the script it seemed to be written to evaluate more than one controller in series. for now ill just run it independently against each environment , but it be great to have just one report. Also in testing I found adding $FileName.Close to end of “Function writeHtmlFooter” prevents the result .htm file from being locked. , so when testing code changes you can modify the code and rerun without having to manually kill the file lock or restart PowerShell. Great Script, Thanks for posting !!! Hi Jess, thanks for using my script and for the feedback. The script intends to run on one farm. Do you have 2 separated delivery controllers in 2 farms? So you need run the script for each farm. The possibility to use more than one delivery controller is just in case the first DeliveryController does not respond. Usually if only one instance of the script runs I have never a file lock. But I’ll doublecheck this again. I have a multisite Xendesktop 76 implementation and like to be able to use this script to check all the sites at 1 go. is that possible? Any chance you have a way to toggle the top 3 sections on/off? I want a version that just has the list of servers and not the top 3 sections…is there a way to comment them out? In the current version not, you need to comment out the lines. I’m working on a future version of the script (first pvs, later XenDesktop/XenApp) in which I work with functions for the checks where it will be much easier to opt-in/opt-out the checks. Great script as usual. I have used this and the older Version for my 6.5 farm for a long time now. Against XenDesktop Pool 7.6 everything Works fine, but when running against XenApp 7.7 i’ve got an error. What am I missing? I’m running the script localy from a XA 7.7 Controller. Hi Anders, I just tested on my XenDesktop 7.7 farm what is virtually the same like XenApp 7.7 … it works fine. Does your delivery controller has a problem, can you try on a second one? Did you add your columns to the code here or in your own script? I could use a copy of that code? Thank you. I am looking at the code and see the load information but not the other updates? Send me the code, I’ll test it and if it’s working I will updated my code on the site. Please also add your addition in the comment (header). Hi Sacha, thank you for the wonderful script. Also, I’m looking for Citrix Presentation Server 4.0 Health Check script. If you have anyone.. plz share..
Hi GP, thanks for your feedback. That’s not so easy, you don’t have powershell, XenApp commands are availible from XA5.x, what do you exaclty need? Maybe I can help you but I’ll not invest time for legacy version scripts. Hi Sacha, thank you so much for the wonderful script. I love it. Thank you, and keep up the great work Sacha. 1. Number of Active Users per XenApp Server -> can I do, will I do in a later version. 2. WMI -> if WMI doesen’t work you have errors e.g. with the uptime, you will notice that. Are you looking for Xenapp Inventory or PVS Inventory? Thanks for the very useful script…… I’m trying to figure out how to remove the “ConnectedUserName” column from the summary. Also, as previously requested, add average CPU and MEM utilization per server just like in the script for XA 6.5. Could this be done? I’ll do an update with the new requests, but currently I’m very busy … please be patient .. sorry for that. Sacha (and other contributers to this script): many thanks for this amazing script! As stated by Bradley earlier, the DesktopFree column for XenApp shows a negative number. In my opinion the DesktopFree isn’t relevant for Shared Desktop environments. Can this being changed in a next release? Thank you so much for this script, been running 0.93 for the past year everyday and it’s a life saver. Unexpected token ‘”DesktopsFree > 0 ! ($AssigmentDesktopsFree)”‘ in expression or statement. the script you can click to download the file has 976 lines of code, so something is missing from the “You can click here to see the Script code …” option. Indeed, just corrected the code. Great update on the script!!!! Can you add an option to enable or disable DFreespace on the ControllerServers and the XenApp-Server/XenDesktop-Server? Of course, I’ll add it in a further version, you have a server with only a C? Will the D be red? you can comment out in the table definition as workaround. I do not have a server with only a c drive, my server at least have a c: and d: drive. I guess an option to disable the DFreespace is really not applicable or needed from my stand point. Ah sorry I didn’t understood, but just had a look in my code and I just realized that I have not yet a D: check. You like that I add the D:, right? Well done on the CTP and the site in general, very useful. Is there any scope for a Storefront Health Check feature. Either as a bolt on to the XDXA script or as a separate scrip. Can the script interrogate remote storefront servers, as well as the local server/server group. Maybe an array of variables that can hold a list of server names? Curretntly I started with the idea that it runs on a SF server, but you can launch it with a Remote session. First start relally early beta is here: https://github.com/sacha81/StoreFront-HealthCheck What checks are on your wishlist? We’ve got a strange issue today : one of our XenApp host was unable to accept new user connection. The server itself was Registered, Ping and able to accept/launch session but the Receiver stuck at “Local Session Manager”. So, after looking more deeply in the XenApp and XenDesktop 7.6 Farm Report we found a server that Ping, was Registered and had a Load Index @ 5000 but no user logged in (no user in the column “Connected Users”). The DDC send all the new connection to that server because it has the less load on it. We need to put this server in maintenance to resolve the strange issue. So, can you add a something like a validation in your report script so if a XenApp host is Registered, Ping and had a Load Index > 1000, highlight the line in red or something like that? It can probably help other people to be proactive. Which value you set here – did the server remain in green even when he has breached the set load index. I hope you understand my need. Should I add the FR on GitHub? Thanks yor the quick reply. If you have a GitHub account anyway then yes please – so I have all request on the same place. We just started using some of these scripts and have found them very useful. Could these two items be added? If these currently exist in one of the scripts, perhaps I am missing it. What u have considered for ServerLoad value for XenApp Servers. Thanks for your wonderful script. It’s awesome. Is there a way to ran the same script for the multiple farms? I’ve 6 farms in our envt and need to manually log into all the farms and check the health. Please help us on this.. one script can ran for multiple farms and get an output. Appreciate if anyone can help us. Sorry this is in the current version not possible. Thank you so much for the script, it works great. Have one question. Uptime for DDC still shows green color even if uptime is more than 2 days. I tried changing the values in xml file for minUpTimeDaysDDC. Is that how it is designed? It’s minUptime and stand for Minumum, it’s to see that a DDC was rebootet. In my point of view it’s not a Problem to have a DDC running many days, the Script show you in a highlighted way when a DDC was rebooted. I understand, Anyway we used reboot delivery controllers in alternate days. i found where to tweak in script to get that. thank you so much. really appreciate your effort. What’s the problem? Just update the XML according your config and run the script. my questions are i dont use pvs so what do i do with those parameters, delte ?,i run it from my delivery controllers?, on each site?, i have to all delivery controllers for each site inside same script or i have to do it sepratelly,i saw xenapp and xendesktop options so i cant run one script for the 2 farms? This script is not PVS related, it has some checks which are Valid for PVS, but don’t care about. It run on your Delivery Controller. You you have a mixed farm with XA/XD just run in once, otherwise 2 checks are needed. Just run the Script on the according DeliveryController. Just try, if you stuck then shout and I will see how I can help you. If you have two farm, you need to setup it two times. Hi , I’m had a quick look on XA-and-XD-HealthCheck.ps1 to replace with existing XenAppServerHealthCheck_XDA7_v1.8.ps1, found the new XA and XD healthcheck is wonderful, but missing the WMI check, XML check, Logons, CTXAgent, ICAPort, CGPPort, vDisk and License status, Storefront status. Can someone help me incorporating the above requirement in a new XA-and-XD-HealthCheck.ps1 script. Guess that’s not the same check, we are on V 1.2.2 and never had 1.8, also no License Status und StoreFront status. Sorry. Who is the author of your XenAppServerHealthCheck_XDA7_v1.8.ps1? I managed to get the service state now, also seems DFreespace if condition need to be corrected (I corrected myself replacing the CFreespace with DFreespace ). sorry for the confusion its the same old deptive script v2 I renames as 1.8. Is there a way to strip the domain and just have the hostname in the table of results for Citrix Controllers health. It is possible, to Display only the unregistered/failure/TimedOut XenAppServer ? Yes, just Switch the parameter ShowOnlyErrorXA in the XML file from 0 to 1. Is it possible to include license status and utilization? this is not designed in this version. I want to put the script on my DC, what would I put in the XML file? I’m able to get the report showing Controller server, Catalog name, Delivery group info. However i’m not able to get any info for XenApp servers. The variable ‘$EnvironmentName’ cannot be retrieved because it has not been set. You have ShowXenAppTable on 0 or 1 ? The variable ‘$hostinvocation’ cannot be retrieved because it has not been set. great script. thank you so much. I’m having a similar issue Kevin was having, it seems as if, the xml variables are not being properly integrated with the script. The variable ‘$PvsWriteMaxSize’ cannot be retrieved because it has not been set. another thing to note. when I use Powershell ISE, it works fine. I’m using version 4. Carlo, there is a new version out you might try that but I’m not certain your issue is fixed in it. If it’s still not working on the new release go to the github link on Sacha’s site and look at the bug list. I found a temp fix for your issue that I’m using right now that I posted out there. You basically define two variables for the XML location and path and it starts working outside ISE. I can confirm that both 1.2.3 and 1.2.4 DOES NOT run correctly with a Scheduled Task. My signature in the email isn’t correct, nor the body of the email. It is missing all the target device information. If I open it up in PowerShell ISE and hit the play button everything works as expected. Again, this stopped working in both 1.2.3 and 1.2.4. What OS? Which PoSh-Version, Which XA/XD Version you are using? How do you call the Script as Scheduled task? Powershell.exe with the Script as an argument? Which XA/XD Version you are using? How do you call the Script as Scheduled task? Powershell.exe with the Script as an argument? We will check, for me and for Stefan it’s working. with 1.2.3 this new maint mode functionality was implemented. Hi Sacha, I have the same issue 1.2.4 works with I manually run in PowerShell ISE but not when used with scheduled task. 1.1.0 was working fine before. I used below command in argument field after which it started working like we run from ISE. Thank you soooo much, that worked for me as well, going to change all my tasks to this. Is it possible to filter the server that will be excluded from health check? The catalog exclusion is not possible because multiple servers are on the same catalog where one of the server need to be excluded from the health check. All is possible – just programming effort. I think to add this feature managed by Tag’s, you can Add a Tag “noHealthCheck” in Studio and the Server/Desktop will be excluded – would this help? This script is amazing. One issue I am having though is that the Ping function is reporting erroneous failures. I can ping the machines from the same server I run the script on, so I’m thinking perhaps it is overloading itself by starting so many ping objects? I get similar issues with the power state check showing machines as “unknown”. Any suggestions? Here it’s working, do you have long response times? Maybe a parnoid security config and user which runs the script is not allowed to ping? looks like our DNS is on the fritz. thanks for getting back so quickly. The script works as intended, it seems! Have you looked in Citrix Studio? Does it show Unknown in Studio? Aye, that will be it. Cheers. I wasn’t sure how the information was being gathered, completely forgot about it being a field in studio! Reboot your delivery controllers one by one and it will clear up the unknown state. You are on 7.6 right? Can we add the values related to Hosting connection like it will check the Host connection and if all well shows green with OK.
And details related to Administrators/Roles and SCope to check wheter there is any new roles created or not. imho Appdisk is death – the new acquired Unidesk technology is the future! I’m not sure if I understand 100% what you mean, but Yes please feel free to contribute on the project in GitHub, Hosting in already in. Excellent script and the output is very neat and easy to read. I am trying to adapt the script so that I can run other health checks against other infrastructure systems and produce a html file with the relevant data. Would you be able to describe the basics of what variables, arrays and hashtables I need to manipulate to change the information from Citrix focused to be almost technology agnostic? For example, I see you have create an empty *results hash, then do a Foreach on a number of items and they then have a couple of if statements, assuming to mark things as passed of failed or 20% sort of thing. and inside the Foreach statement you first create a $tests hash, but I am unsure how you get the properties such as $tests.AssignedToUser and $tests.NotToUserAssigned? Hope this makes sense and you are able to help! Permission on farm? Firewall from location where script runs in the direction of the target? This is an excellent script. it help me to get my daily Health check. I have a issue. i am having more thane 600+ XA and XD machines. to get the report script is taking more than 40 min. Is there any way to speedup the process. You can comment out unneeded checks, unfortunately it’s not easy to parallel Checks. Thanks Sacha for your responce. can you help me in adding a date to log file and output file name. i am able to add date to output file. I recently upgraded from PVS 7.1 to 7.6 cu4 and the PS script stopped working. apologies – I will repost in correct forum. My issue is that the snapin will not re-register. Thanks for the nice script. I see that I get “Err” in AvgCPU used column. It is not on all the servers, but on few of the servers. What could be causing it to ERR out? Does XenApp 7.5 supports gMSA? I want to set this script in Scheduled Task running under gMSA. We mentioned the catalogs to excluded however script is processing all the checklist and only skip it in the reports. Which is waste of execution time and been taking too long to get the result. How can we exclude the machines from the execution? Yes, that’s unfortunately correct. I just created an Issue on GitHub (https://github.com/sacha81/XA-and-XD-HealthCheck/issues/56 ) If you have the time and the knowledge feel free to adjust that and put the improved version on GitHub. Modified the script and attached here https://github.com/sacha81/XA-and-XD-HealthCheck/issues/56 . Please review it and let me know if it requires any correction. Thank you Saravana! It’s now in the new Version. Great! Should all also working on physical computers – what issue do you have? i am not an expert in Powershell. in the XA and XD healthCheck.ps1 file. I am not able to find a way to enter the path under get-content to read the content of XML file. Could you please let me know where should i make the changes to add the path for this. Just wanted some input on the script. It has been running fine. The only issue I’ve run into as of late is it seems to stop or pause when it runs into a device that has WMI issues. Is there anything you can do to detect and bypass these types of errors? The property ‘VersionInfo’ cannot be found on this object. Verify that the property exists. I have the same issue as Rob. My environment consists of ONLY windows 10 desktop OS. The only output is for DDCs. Just wanted some input on the script. It has been running fine but getting VersionInfo error. Please suggest what could be the possibility of error. which line of the script is that? It has been running fine, what did you change that the error occurs. Hi Sacha, It showing error while executing machine OS Version and i did not change anything in the script file. Is the Windows installed on C: ? Ravi- Yes OS is installed. the file exists which the Script tries to read and the user which run’s the script has access to it? Do you see anything in the eventlog? Go to the destination system and see with procmon why there cannot be accessed. Sorry cannot help more here, not a Bug on the Script. Permission issue in your Environment. get-wmiobject -namespace "ROOT\CitrixLicensing" -computer YOURSERVER -query "select * from Citrix_GT_License_Pool"
My second issue is Cataloginformation returns blank, though log file has the information. It only shows the table header. Can you help me with the problem that the catalog cannot be displayed? hi, do you have a dash in the catalog name? I cannot reproduce this – error message in log? Sacha, I am having difficulty to get the email part to work. we are using office 365. I have some question about this script. 1.Is it require only DDC? it is not working on other citrix server. 2.What kind of resource is use on server while script Running. 1. Because of the FMA architecture it needs the DDC yes. 2. It’s just tho PoSh snapin provided by Citrix – Memory&CPU depends of the size of the environment. Has anyone tried this script on XenDesktp site hosted in Citrix Cloud? I haven’t tested much but by simply placing connector names in place of delivery controller did NOT work. Hi Sacha, This script is fantastic! So far it has worked great. It seems like I ran across something in the script that is not running, I’m sure its something I’m doing wrong but I would like a column in xendesktop that shows the last time a VDI was used. We have a policy that allows us to reclaim a VDI if it hasn’t been used for >= 60 days. Is there something I can do to get this part of the script to work? Again, thanks so much for all the work you and Github do. In Version 1.3.7 the functionality for the column “LastConnect” was added which shows the last connection over ICA. Does this address your request? Yes, I see that column now! Thanks so much! Oh, I forgot to mention that the report is running great but not sending the email with the html report. It used to work and I’m pretty sure I have not changed the XML file. Do you have any ideas why this may not be working? Thanks. Ok, I figured out why the report was not sending but I have a new question. I have some Linux VDIs, specifically Ubuntu 16.04 and CentOS 7.5. During the running of the script these devices get errors referring to “The RPC server is unavailable” and “WMI connection failed”. These are looking in “\\$machineDNS\C$\Windows …” Linux obviously does not have this path. Is there a fix for this? Thanks. Hi and thank you for your job! I try to make it work on a Windows 2016 server but I could not succeed, our PS version is 5.1. Do you think is possible to make it work? What error do you see? I have a lot of that errors, in english is something like "Ampersand not allowed. The & operator is reserved for future use…" and "<" it's the same. perluète entre guillemets doubles ("&") pour que ce symbole soit considéré comme une chaîne. You can rewrite the part’s for the Perf counters if you wish to use it. Does it work in 7.15CU3 ? Do we need to update ask ? Currently we run in Citrix.Admin.V1.. V2? there is no known general issue, I have one productive environment with 7.15 CU3 where check is running fine. The variable ‘$EnvironmentNameOut’ cannot be retrieved because it has not been set. The variable ‘$CatalogHeaderName’ cannot be retrieved because it has not been set. The variable ‘$CatalogHeaderNames’ cannot be retrieved because it has not been set. The variable ‘$emailFrom’ cannot be retrieved because it has not been set. The variable ‘$emailTo’ cannot be retrieved because it has not been set. The variable ‘$emailSubject’ cannot be retrieved because it has not been set. The variable ‘$emailPrio’ cannot be retrieved because it has not been set. The variable ‘$smtpUser’ cannot be retrieved because it has not been set. there seems to be an issue to read the XML – is the name from ps1 file and xml equal? Sounds more like e PowerShell issue, what version of PowerShell is in use? The variable ‘$ErrorVDI’ cannot be retrieved because it has not been set. Method invocation failed because [System.Double] does not contain a method named ‘Split’. Hi Sacha, we changed our license server last month from Windows Server 2012 to 2016. Ever since that time the script is able to get the LicenseServer name but the LicenseName, Count, InUse, Available are listed as n/a. Do you know what this might be? Thanks so much! not enough permission on the new Lic Server – had a similar issue some weeks ago. In Citrix Studio under Configuration/Administrators I am in a group with the Full Administrator Role. Is this the permissions you are referring? I’m not sure as to what permissions I need to check? Thanks. Is it possible to add Pending update (ImageOutofDate) and Image (MasterImageVM) used to the member server catalog to the table? Hello, I will do this in future, have it in a GitHub Issue already long time (https://github.com/sacha81/XA-and-XD-HealthCheck/issues/4), but as I use no MCS I had no Priority on this until now. I try to implement it soon. The masterImageVM will be very helpfull when you are using app layering with MCS. I just wanted to post a thank you for the great work you have done with this script. I have showed it to a few places and got it up and running for them to have an emailed report 3 times a day on their farm.